Built to U.S. Military Standard 810G, the Garmin Instinct watch is built for the most rugged of uses. The fiber-reinforced polymer case is designed to be shock, frost and water resistant (to 100 meters), while the chemically strengthened glass display holds up against scratches. The monochrome screen is viewable in even the harshest sunlight due to the high contrast display. With a fully vented silicone band with specially designed removable keeper loops, you can rest assured that your watch will never snag on things when you’re in action. GPS, GLONASS, and Galileo satellite systems make the Instinct accurate, reliable and technologically advanced. Dependability is at the forefront of the Instinct watch with its built-in sensors including a 3-axis compass and barometric altimeter. 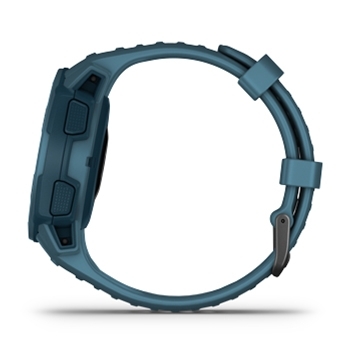 Sensors also include Garmin’s Elevate wrist-based heart rate monitor. Stay connected with loved ones by using the Instincts Bluetooth and smartphone connectivity. Easily view messages from the watch display. Control your smartphones music or your Garmin VIRB camera directly from the Garmin Instinct. Let your Instinct monitor your health and wellness. Set step and calorie goals, monitor sleep, stress and work towards improving your Garmin Fitness Age. The Instinct can even serve as your personal trainer with cardio workouts, automatic rep counting and customizable activity profiles. Download training plans and workout alongside your Garmin Virtual Partner. There is never a need to slow down your busy lifestyle to offload data. 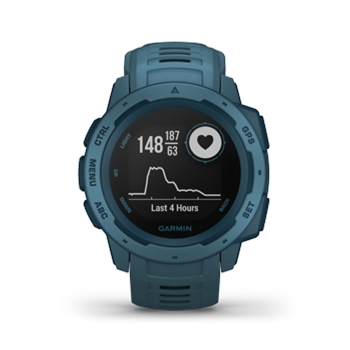 The Instinct will automatically offload data to your Garmin Connect online account (downloaded for free from Garmin). Enjoy advanced running and outdoor features. With point-to-point navigation, enjoy running without the worry of finding your way home. Create breadcrumb trails and navigate from waypoint to waypoint (watch does not allow for detailed mapping) or plan your trip on the Garmin Explore App prior to leaving home. The Instinct boasts a battery life of up to 14 days in smartwatch mode, up to 16 hours in GPS mode and up to 40 hours in UltraTrac battery saver mode. The Instinct GPS smartwatch is powered by an internal rechargeable lithium-ion battery and includes 16MB of storage and memory space. 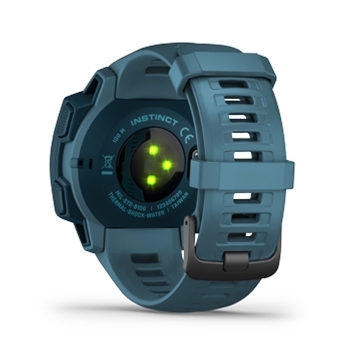 If you’re looking for a full featured, rugged GPS watch, the Garmin Instinct is for you.